Early Earworm Gets the Bird? I swear i’m not a Grinch. Really. Although I find getting ready for Christmas to be the most stressful experience of the year, I do my best to get into the Christmas spirit and enjoy the holidays. I buy presents for family and friends. I help stuff and baste the turkey. I dutifully go to church every Christmas Day even though I’d probably rather stay home and open presents. I buy egg nog at the grocery store, even though I have no idea what it is. I even have the sweater, five sizes too big, that my grandmother knit me for Christmas in 1995, and I will happily wear it again this Christmas, even though it hangs down well below my knees. I am prepared to make sacrifices in the spirit of the holidays. This does not, however, extend far enough to make me feel inclined to go see the Messiah again. No Nutcracker either. I think I sat through enough amateur productions of the Nutcracker to sing the whole score from memory, and I could probably do the same for the better part of the Messiah as well. I don’t mean to detract from those who enjoy these holiday traditions, but I find surviving the holidays stressful enough without an incurable case of earworm accompanying me everywhere I go, thank you very much. However, if you are so inclined to take in a Messiah this holiday season, you can do no better than Tafelmusik’s “Sing-Along Messiah” December 22 at 2pm in Massey Hall. Tafelmusik has been doing this for 25 years. They know what they’re doing. Ivars Taurins will dress up as Handel. It will be fun. Bring your own score. Or, if you’d rather let someone else do the singing, catch their other performances and hear soloists Emma Kirkby, Laura Pudwell, Colin Balzer, and Tyler Duncan sing it for you in Koerner Hall December 18 to 21. If you prefer a more authentic version, you can also head down to the Glenn Gould Studio at 8pm on December 21 to check out the Aradia Ensemble’s Dublin Messiah, based on Handel’s original version composed for (ahem) Easter in 1742. Both of these productions are very good. I highly recommend them, although I won’t be there. Delayed onset: Alternately, if you are trying to delay the onset of Christmas for as long as possible, you might want to check out a couple of concerts in December that are in no way Christmas-themed. The Rezonance Baroque Ensemble will be presenting chamber works by Telemann and Erlebach as well as solo works by J.S. Bach in an afternoon concert at the Tranzac on December 8 at 3pm. If you’re the sort of person who is more inclined to look for a pub on a Sunday afternoon than a concert hall, you’ll find the cozy and welcoming atmosphere of the Tranzac very appealing. (Also in the interest of full disclosure I will mention that I will be playing harpsichord in this concert. Please do not heckle unless I’ve given you a bad review recently.) The La Mode Quartet will also be giving a concert worth investigating that weekend on December 6 in Bloor Street United Church at 8pm with chamber works by Rameau and Guillemain as well as one of the Telemann Paris Quartets, which are some of the most beautiful (and difficult) chamber works of the 18th century. And anyone observing Advent and wanting to take in a concert might want to check out the Musicians in Ordinary’s concert for the Advent season, featuring Magnificats by Vivaldi and Telemann at St. Basil’s Church December 3 at 7:30. Involuntary vac: If you feel like seeing a concert in the New Year, be warned — January is an extended (and largely involuntary) vacation for baroque musicians on the Toronto scene. Thankfully, the Musicians in Ordinary have put together a program for New Year’s Day that will round out the holidays quite enjoyably. This concert features the French Baroque composer Elisabeth-Claude Jacquet de la Guerre, a child prodigy and well-known composer of cantatas and solo instrumental works during her lifetime, and the Musicians in Ordinary will be performing her cantata Le Sommeil d’Ulisse (The Sleep of Ulysses). You can catch them at 2pm at Heliconian Hall. Two Toronto-based baroque musicians who won’t be taking a vacation this winter are Daniel Taylor and Jeanne Lamon. 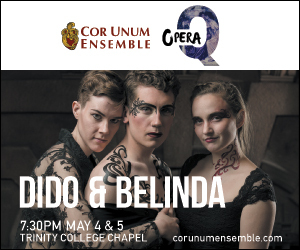 Both Lamon and Taylor have teamed up to put together a performance of Henry Purcell’s Dido and Aeneas, which ranks as Purcell’s best-known work, a 17th century English classic, and the only major English-language opera composed before 1900 that is still performed today. (There is perhaps one other — John Blow’s Venus and Adonis, which I’m still waiting to see performed in town.) Taylor and Lamon are directing the Schola Cantorum and the Theatre of Early Music for three performances of Dido and Aeneas at the Trinity College Chapel January 17 to 19. (If you miss this program, you can still catch another Theatre of Early Music concert a week later, as they will perform works by Gibbons, Purcell, Tallis and Handel in the same hall on January 26. Late Jan: The concert season will pick up later in the month of January as the Musicians in Ordinary (who, I have to say, are really starting to emerge as the hardest-working musicians in Toronto in the next couple of months) have yet another performance, this time featuring violinist Chris Verrette playing five of the Biber Rosary Sonatas. Verrette, in between regular concerts with Tafelmusik, has been working his way through all 15 of these sacred instrumental works this season, and he plays them with remarkable sensitivity and grace. Definitely try to hear him if you can — this concert is at Madden Hall on January 24. Finally, Tafelmusik returns with a program that features some exceptional chamber and orchestral music by J.S. Bach. “Intimately Bach” will be a great chance to hear Bach’s Triple Concerto for flute, violin, and harpsichord BWV1044. It’s scored the same as the Brandenburg Concerto No.5 and is not as famous, but is easily as great a piece of music as the more famous Brandenburg. Soloist Grégoire Jeay will join Tafelmusik to play flute, and the orchestra will also play Bach’s Violin Concerto in G BWV1056 and his Trio Sonata in C BWV529. Tafelmusik will be back at Trinity-St Paul’s Centre for this concert January 29 to February 1 at 7 pm, with a matinee on February 2.